With family and friends in town, my past two weeks have been a pants-expanding, late night devouring, cocktail imbibing and all around omnivorous experience. It began by meeting my father and baby brother (at 23 he’s still a baby, right?) in DC for a weekend with my uncle. My uncle is always sending me updates and clips referencing chefs, opening restaurants, and international food news (really any information that pertains to food or the cooking industry). It’s a sweet way of staying actively involved and I relish the little email blurbs I get sporadically from him. However, I know when I go to visit him, he’s going to try to kill me with food. He and his partner Peter are very fond of their DC hole-in-the-walls and Virginia’s Asian strip mall restaurants, so when I visit, they want me to try all of their food finds. “OOoo Claire! We know how much you love Korean. Do we have the spot for you!”. And then we proceed to order 12 items from the menu, followed by a reordering of their favorite items. “Weren’t those kimchi dumplings fantastic? Let’s order another round!” They try to squeeze in as much as possible in the few days I’m in the city, so there’s always too much eating to be had. But I guess that’s not the worst problem in the world. This time we made a little drive to Annandale, VA to a Korean and Japanese restaurant called Yechon. We bi-passed the sushi and instead filled our table with soup and dumplings, the fieriest jap chae I’ve every had, octopus stir fry, and then kimchi and banchan filled in any and all free space on the table. I was totally floored that Virginia had great Korean cuisine. After a long weekend of Korean, Chinese and a sole non-Asian meal of American/Italian, I was ready to get back to a semi-normal diet of my New York family kitchen dinners and grazing-throughout-the-day technique. That wasn’t going to happen. The night I got back from DC, my sweet Korean friend came to town to sample the Korean scene in NY. Now that she works for Sempio (Korea’s yummiest soy sauce and chili paste producer), she needed to learn how her products could fare in New York’s food arena. She had to eat at several spots and invited me along to the newly opened Jung Sik. How could I turn down a chance to eat at one of the newer fine-dining spots in the city with one of my favorite ladies? Seoyoung and I bonded years ago over Korean cooking. I liked to eat it and she liked to cook it. Together we would create enormous lunches of sam gyup sal, ferment our own kimchi, eat “birthday soup” as a snack and write about our food adventures on our old joint blog Not Fine Dining. I went out to visit her this past Spring and she stretched my stomach like only she knows how. We ate meal after meal, sampling dumplings, icy beef broth soup, fried street foods and homemade dinner spreads that could rival the best Korean restaurants. Now that she works for a Korean condiment producer, she could explain to me in depth the process of how each ingredient is made. I felt fully immersed in Korean cuisine. 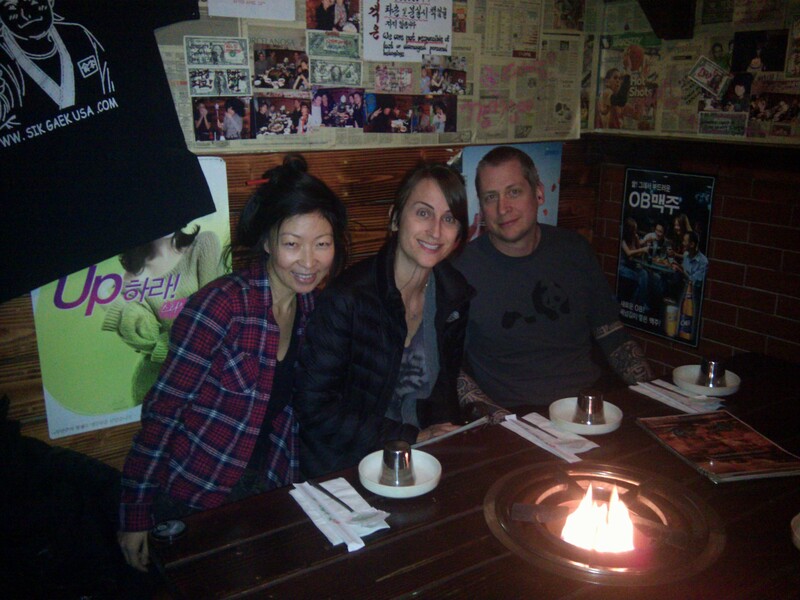 Here in New York last week we got to dip back into that old relationship and catch up over Korean food. However this new restaurant takes the homeland cuisine and marries it with French technique. I wasn’t sure how I was going to react to the cuisine, and after a week and a half of mulling it over, I’m still not sure. We sat down to a young captain with an affected British accent (maybe he was practicing for a part in an off-Broadway play??) and a modern room in shades of grays and clean lines. We were the first to arrive for dinner service, so the room was free of chatter and music. I felt like we had to whisper, until our waiter broke out his fake accent…and then I felt like I could barely control my laughter. It was an odd way to begin our fancy Korean dining experience. The food was beautiful, coming out in tiny bite-sized portions à la French Laundry or Eleven Madison Park. But the Korean flavors were muted. The heat that I love so much from gochuchang (spicy red pepper paste) was hardly present. A lobster salad that was perched in tiny pieces atop a thin layer of apple gelée lacked heat and zing. All the reasons I adore Asian cuisine were swept under the rug, with only a fleck or two of spice poking out here or there as a reminder of the chef’s native cuisine. He wants to claim the food as haute Korean, yet the Korean ingredients are not in the forefront of the cuisine. The food is light and fresh, however the boldness (from spice, fermentation, fish sauce, soy, ginger, onion etc.) was too light handed for my heat-loving mouth. His best dishes were his rice dishes. Though Koreans don’t do risotto, the chef channeled his “Koreaness” with his love of European technique and created his own unique version of the dish. Birthday soup is a common, healthy and satisfying seaweed soup that is eaten both on one’s birthday, and on the day a woman gives birth to a child. It’s thought to be nourishing and have medicinal qualities. 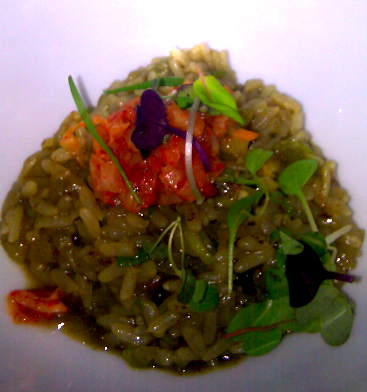 Chef Jung Sik combines the seaweed flavor (here he uses dried noori) and incorporates it into the risotto. The result is a creamy, familiar Western dish, with the salty sea green flavor often used only in Asian cuisines. His rice dishes were by far the highlight of the tasting. The food was fun to eat, like a tasting menu usually is. A bite of this, a thoughtful moment mulling over the inspiration behind each dish, and then a run down between me and Seoyoung on our thoughts after each course. But I have to be honest and say that I prefer a down home, dirty meal over the fine dining, prim and proper experience of the white table cloth kind. Which brings me to last night, when my sister and her husband were in town. We hopped in a car with our friends Nolan and Maya and made our way to Woodside, Queens. We clambered out of the car, starving, and into a restaurant that was bumping beats loud enough to be heard even through its heavy wooden doors. The staff yelled their hellos from the kitchen and came to lead us to a booth in the back. Korean hip-hop and pop rocked at a medium to medium loud all night. The crowd was young and the food was steaming with flavor. Maya and Nolan did the ordering, as they’d been several times to this little gem before. 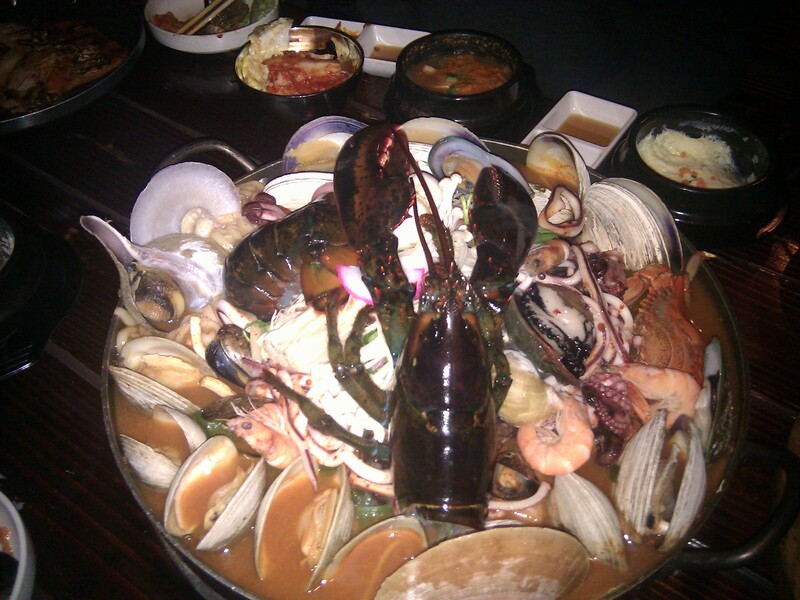 We ordered kimchi pancakes, crispy and chewy seafood pancakes, pork belly and a ginormous dish of seafood hot pot. At eye level, just a foot and a half from my head, tiny octopi and abalone suctioned around the fish tank to my left. Periodically I saw a net dip in and take out a cephalopod, only to see a plate of chopped up and wriggling bits delivered to a nearby table. Our hot pot was set on our fire burner and immediately the lobster, whose head and body had been separated, began wriggling in the simmering broth. Clams and oysters and mussels died right in front of us, opening their shells and releasing their briny liqueurs into the simmering stew. We stuck our chopsticks in and fished for shrimp, noodles, bean sprouts and baby octopi. As the broth reduced, the heat intensified and our lips became inflamed with the spicy seafood essence. These past few weeks have combined my favorite things in life: family, friends and food. 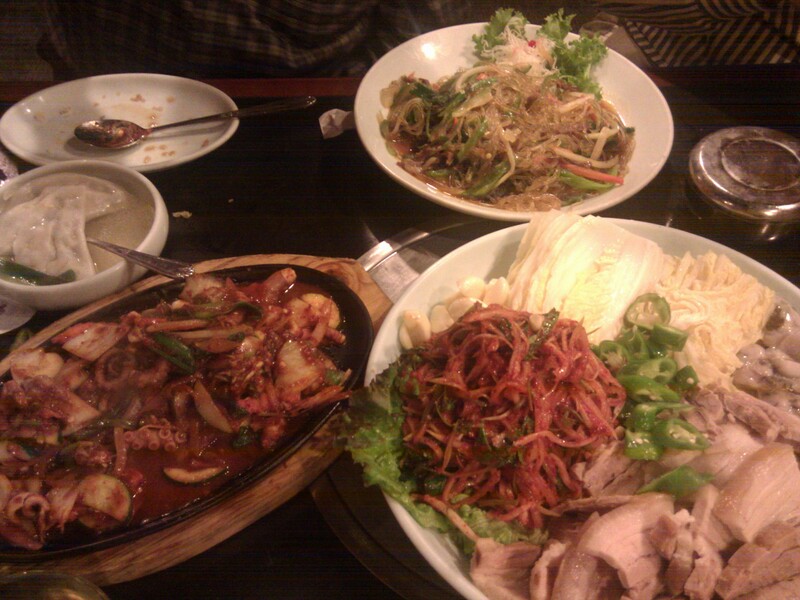 Some of the most memorable moments were had over Korean cuisine. Coincidence? Or does Korean have the power to create memories over simple, tasty dishes? Bold flavors, live seafood and pork-centric dishes all make for exciting meals, and it’s easy for good conversation to flow over good food. Korean, you’ve done us well. I think I’ll come back for more soon.